KUALA LUMPUR: UEM Land Holdings Bhd has ambitiously targeted a 40 per cent net profit increase under its Key Performance Indicators (KPI) this year. The property developer is also aiming for 50 per cent growth in revenue this year, its managing director and chief executive officer Datuk Wan Abdullah Wan Ibrahim said. UEM Land, the country's largest propery company by market capitalisation, saw its net profit increase 55.1 per cent in the year ended December 2011 to RM301.7 million. Group revenue climbed 261.5 per cent to RM1.7 billion from RM469.7 million in the year before, exceeding its 2011 KPI target. Wan Abdullah said the optimism is driven by various project launches this year, which has a combined gross development value of RM4.5 billion. "For 2012, UEM Land aims to achieve RMM3 billion property sales with planned new residentail and commercial property launches in Nusajaya (Johor), Mont Kiara, the Kuala Lumpur central business district and Kajang, Selangor with a total gross development value of RM4.5 billion," he said. Wan Abdullah was speaking at a press conference on its 2011 financial results here yesterday. 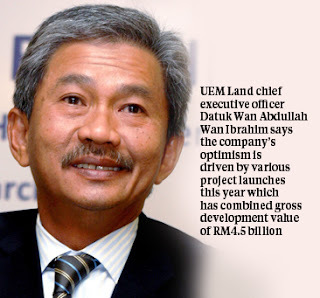 UEM Land reported total sales of RM2.2 billion in 2011, exceeding the target of RM2 billion set at the beginning of 2011 with total unbilled sales value of RM1.8 billion as at December 2011. UEM Land, the property arm of government-owned UEM Group Bhd, is the master developer of Nusajaya, Johor and is fresh from its acquisition of Sunrise Bhd. He said property demand is expected to be strong this year, with the completion of several projects especially in Nusajaya such as University Of Southampton, Marlborough College, Legoland, Trust School, Bio-Xcell, Institut Maritim and Traders hotel. Some of the company's projects that will be launched this year include Nusa Idaman, East Ledang, Nusa Bayu, CS2, Lifestyle Retail Mall and Residence, Summer VOS, Lot 149 (at the former Bangunan Angkasaraya Jalan Am-pang), Mont'Kiara 22, SL 1,2 & 3, Kajang, Arcoris and Symphony Hills. On another note, Wan Abdullah said UEM is in talks with foreign parties on joint property projects in Southeast Asian countries such as Myanmar and Vietnam as well as in India. "We are also looking at increasing our 3,643.7ha landbank in Sabah, Sarawak and the region and expect to seal a deal this year," he said, without elaborating.